Rosemary, Rosmarinus officinalis, is a plant which is native to the Mediterranean, which has been used as a spice. However, Rosemary has many medical applications as well. Rosemary’s Leaves and Twigs are made into Dried Whole Herb, Dried Powdered Extract, Tinctures, Teas, Liquid Extracts, and Oils. Rosemary has been called many different names, including Compass Plant, Compass Weed, and Polar Plant. Research has shown that Rosemary might have applications in Improving Memory, Hair Growth, Preventing Blood Clots, and Inhibiting Growth of Food-Borne Pathogens. Recent Studies have shown Rosemary might Improve Memory. Rosemary has Antioxidant activity, which neutralizes Free Radicals and protects our cells and DNA. Rosemary’s ability to neutralize Free Radicals is associated with a decrease in the stress hormone, Cortisol. Decreased Cortisol is associated with reduced anxiety, and greater ability to recall information (Atsumi, and Tonosaki). Carnosic Acid and Carnosol, are compounds in Rosemary, which increase Nerve Growth Factor (NGF), and as a result improve memory (Kosaka, and Yokoi). Enhancing Hair Growth is another one of Rosemary’s clinical applications. In a study conducted, 44% of individuals with Alopecia Areata experienced an increase in hair growth after use Rosemary Oil, combined with other essential oils. (Hay, Jamieson, and Ormerod). Research has also shown Rosemary may help prevent Blood Clots. Rosemary inhibits proper mobilization of Calcium. Calcium is an important part of the coagulation cascade. Additional Research needs to be done, but Rosemary could have applications as an anticoagulant. Lastly, Rosemary has Anti-Microbial properties which are useful against Food-Borne. It has been demonstrated that Rosemary kills L. monocytogenes, and when ground Rosemary was added to refrigerated meat, it delayed L. monocytogenes growth (Pandit, and Shelef). Also, a study conducted demonstrated that Rosemary also inhibits the growth of E. coli and Salmonella (Elgayyar, Draughon, Golden, and Mount). Rosemary does not produce many side effects; however, Allergic Reactions have been reported. Also, too much Rosemary can cause toxicity which results in Vomiting, Spasms, Coma, and Pulmonary Edema. Rosemary is contraindicated in women who are pregnant or nursing, as it increases menstrual flow, and can cause an abortion. However, pregnant or nursing women can eat rosemary as spice with meals. Rosemary is also contraindicated in individuals with Hypertension, Ulcers, Crohn’s Disease, and Ulcerative Colitis. 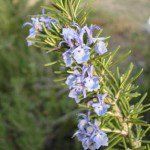 Rosemary has been known to interact with Anticoagulants, ACE inhibitors, Diuretics, Lithium, and medications for Diabetes. Rosemary is itself a Diuretic, so it would create too much water elimination if used with other Diuretics. Also, if too much water loss, can increase Lithium concentrations, resulting in Lithium Toxicity. Rosemary also affects blood sugar levels, so it could interfere with drugs used to control Diabetes. Atsumi, T, and K Tonosaki. “Smelling lavender and rosemary increases free radical scavenging activity and decreases cortisol level in saliva..” Psychiatry Research. 150.1 (2007): 89 96. Print. Ehrlich, Steven. “Rosemary.” University of Maryland Medical Center. N.p., 03 Apr 2011. Web. 21 Jun 2012. Elgayyar, M, FA Draughon, DA Golden, and JR Mount. “Antimicrobial Activity of Essential Oils from Plants against Selected Pathogenic and Saprophytic Microorganisms .” Journal of Food Protection. 64.7 (2001): 1019-1024. Print. Hay, Isabelle, Margaret Jamieson, and Anthony Ormerod. “Randomized Trial of Aromatherapy:Successful Treatment for Alopecia Areata .” Archives of Dermatology. 134.11 (1998): 1349-1352. Print. Kosaka, Kunio, and Toshio Yokoi. “Carnosic Acid, a Component of Rosemary (Rosmarinus officinalis L.),.” Biol. Pharm. Bull.. 26.11 (2003): 1620-1622. Print. Lee, Jung-Jin, Yong-Ri Jin, Ju-Hyun Lee, et al. “Antiplatelet Activity of Carnosic Acid, a Phenolic Diterpene from Rosmarinus officinalis.” Planta Med . 73.2 (2007): 121-127. Print. Pandit, VA, and LA Shelef. “Sensitivity of Listeria monocytogenes to rosemary (RosmarinusofficinalisL. ).” Food Microbiology. 11.1 (1994): 57-63. Print. “Rosemary.” WebMD. N.p., n.d. Web. 21 Jun 2012.